That is Jupiter below and Mercury up and to the left. 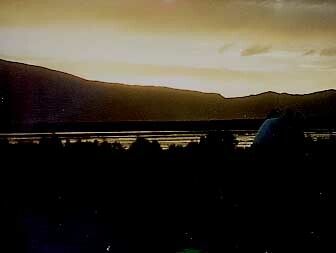 This was taken with an 8 mm cannon video camera. 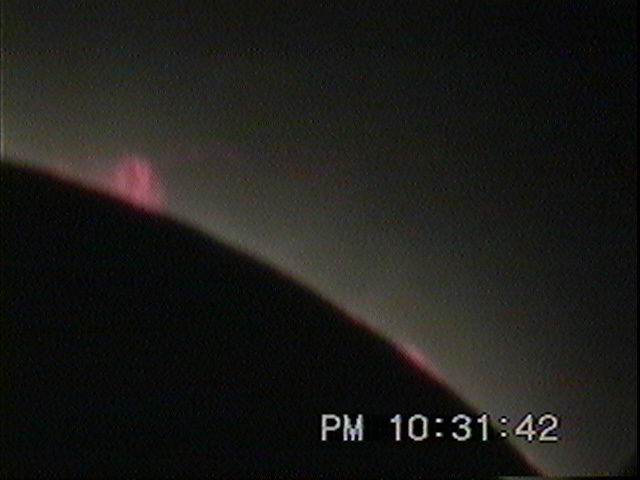 Do not miss the photo of the two prominences toward the bottom of this page. I have more video and photos coming and will add them as I get them to this site. 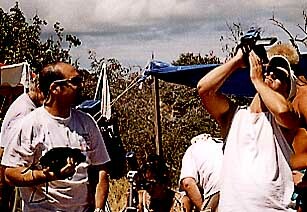 That is me at the controls of my telescope video camera. I am using and TV monitor to aim and focus. The red goggles are to help dark adapt my eyes prior to totality. I had taken my small children to an eclipse that occurred in Washington State in about 1979.Ý I was not well prepared for the eclipse. 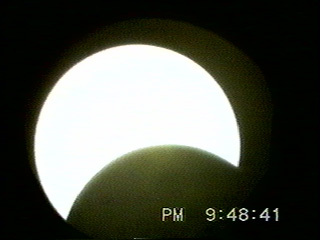 We had a pin hole viewer made of a long cardboard tube that gave us an image about an inch in diameter. I enjoy totality but was amazed at the reaction of the children particularly my 3 year old daughter who clung to me with a near death grip, an almost an animal like reaction, during totality. That is Carlos Gerke on the left and a group of us on the right set up for photography. My next experience came in Bolivia a few years ago where I was better prepared. 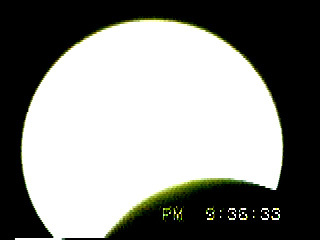 I had taken an old telephoto camera lens and made a viewer that showed the suns image a full 8 inches in diameter. I also had 2 cameras to take photos. This time I was more prepared, but was so enthralled I forgot the agenda I had developed as to which camera with which film should be taking a photo at what exposure as the eclipse progressed to totality. I stood slack jawed for the first minute just staring at the image of the corona streaming from the sun. The fact that we were viewing from Bolivia's Altiplano, a plateau which is at 13,000 feet, probably has something to do with my forgetting my photographic timetable. This is at about 50 times magnification with a Sony handicam through a 500 mm lens with a 40 mm eyepiece. It was taken at 1:36:44 local time (17:36:44 UT). 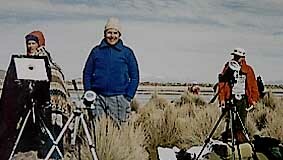 In Bolivia, we had coerced our Bolivian friends to come along on the adventure. In fact, they had arranged a convoy of 4 vehicles and about 16 other friends who were up to driving 7 hours on unimproved roads with these crazy Americans to see the Puma take a bite out of the sun. It sounded silly to them, but it might be fun and they were due for an adventure. To the person, they came to me later an thanked me for dragging them to the viewing site and asked me where the next eclipse would take place. The horizon is illuminated at totality. That is me in the blue. As the sky got close to totality it got very cold, close to freezing. In the next few years there were other Eclipses one in Vietnam had me thinking but I had been there as a dentist attached to the Marine Corps and was not yet ready to go back. Another in Siberia seemed cold. 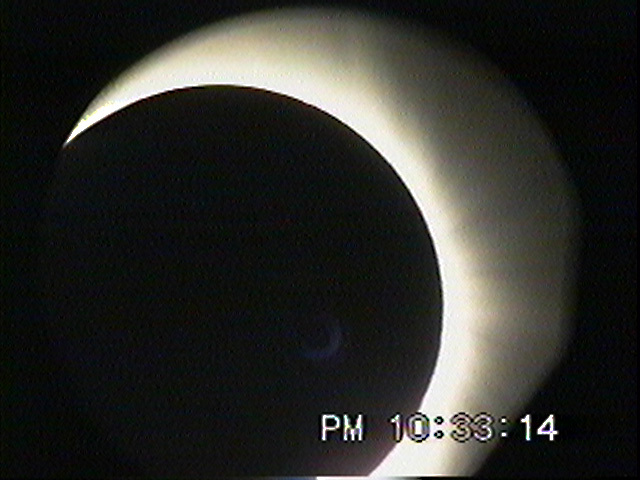 I was delighted when I found out about this eclipse that occurred from the Galapagos to the Caribbean. This is at about 50 times magnification with a Sony handicam through a 500 mm lens with a 40 mm eyepiece. It was taken at 1:48:52 local time (17:48:52 UT). The next question was where to view the eclipse. We had been to the Galapagos and enjoyed the islands. However, I was concerned that they would make us view from a boat. Venezuela was an option, my wife had lived there and speaks Spanish. Curacao and Aruba had the best chance of good weather. However I wanted to sail either before or after the eclipse and could find no charter fleets at either island. Some of our group do not take eclipses very seriously. Our next choice was Antigua, Montserrat or Guadeloupe islands. 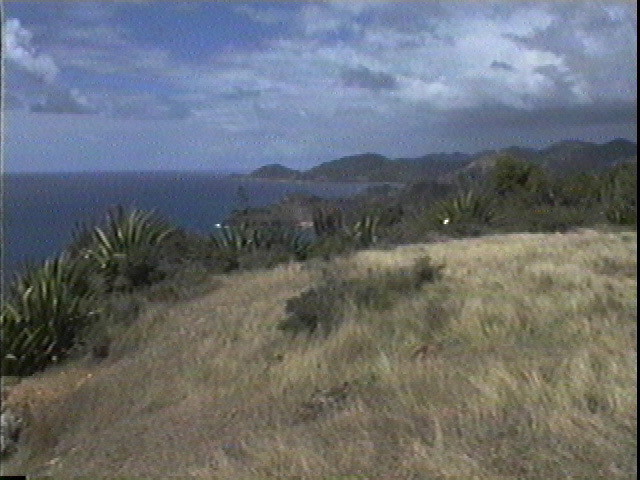 There were charter sailing fleets on both Antigua and Guadeloupe. Montserrat had an active volcano that was erupting and the best viewing was in an area covered with ash and off limits because of the ongoing eruptions. So we chartered a boat at Antigua.Ý If the weather was bad at least we could enjoy sailing and warm weather for a week or two. This is at about 50 times magnification with a Sony handicam through a 500 mm lens with a 40 mm eyepiece. It was taken at 2:05:25 local time (18:05:25 UT). Each 45 foot catamaran held 8 people. 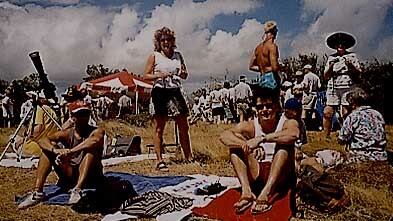 We filed the first boat immediately and chartered a second which filled with our adult children and their friends. A third boat became necessary when a friend with two children decided to come. In all, we ended up on 4 boats with 30 people. We had friends from Seattle, Vermont, Virginia, North Carolina, Missouri and Bolivia. The common thread they knew us and were up for an adventure. Many of us arrived a few days early to take advantage of the sun and warm and to get our clocks turned around. Jolly Harbor Resort was found on the internet and described as a inexpensive housing. I expected a motel with pealing plaster and paint. Instead we had great condo units. Two bedrooms upstairs a kitchen and living room down, a veranda leading to a dock on a boat channel. The complex included 3 restaurants, a beach that was close to a mile long, a large marina and shops. It could not have been better and the $100 a night per couple was affordable. This is a view looking to the Southwest from Shirley Heights about 2 hour prior ot totality. I decided to view the eclipse from Shirley Heights which gave us the greatest duration of totality on Antigua but also was a very picturesque venue above English Harbor. English harbor was Nelson's base in the Caribbean and is being restored and includes many shops and a museum. I had contacted the museum curator, Desmond Nicholson, who had arraigned for tents for shade and protection from the usual trade wind and a generator for TVs and cameras. The site was on a hill next to a cliff. It offered some privacy from the crowds that were expected on the Heights. Desmond had also invited the museum members to join us to view from this site. Desmond and his wife Lisa wrote a great description of the eclipse. 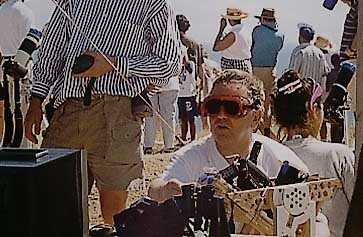 I had made arrangements with Jay Rainey of Tropical Studios, an Antigua video production company, to be at the eclipse site. Jay brought 3 TV monitors, a back up generator and a commercial TV camera. My goal was to photograph the eclipse with two video cameras one that was focused through a telephoto lens to give close up views of the corona and any prominence and a second camera for a wider view. The images would be live on the TV monitors and be recorded for later study and enjoyment. This is at about 100 times magnification with a Sony handicam through a 500 mm lens with a 40 mm eyepiece. It was taken at 2:30:05 local time (18:30:05 UT). My camera timer was set at Pacific Standard Time (home) and the seconds were 11 seconds slow. The day prior to the eclipse had been overcast. Eclipse morning dawned cloudy but as the morning advanced the thin clouds parted and then disappeared. By eclipse time the sky was clear in all directions as far as the eye could see. There was a slight breeze, under 5 knots, and the thermometer was climbing above 90 degrees. Just moments prior the start of the eclipse, the computer controls for my telescope mount computer controls for my telescope mount began to smoke as circuit boards became toast. With the stepper motors inactive, I had to aim and move the scope by hand. At 300 time magnification you can see my heart beat in the pictures however, I did get some remarkable views of the corona and solar prominences. Just after first contact and Scotsman from Australia strolled through our area playing the bagpipes. He felt it appropriate accompaniment for such an event. The Bolivians had beat drums in the belief that the noise would scare away the Puma that was swallowing the sun, an Indian myth that explained eclipses. I thought a bagpiper should be as effective as drums at causing what ever monster that swallows the sun in Caribbean lore. This is at about 100 times magnification with a Sony handicam through a 500 mm lens with a 40 mm eyepiece. It was taken at 2:33:16 local time (18:33:16 UT). My camera timer was set at Pacific Standard Time (home) and the seconds were 11 seconds slow. At about the same time, several taxis unloaded a wedding party from Illinois. The bride and groom had decided to be married during the eclipse. They heard the bagpiper and asked if he would play the wedding march. He agreed and hiked down the hill to practice for the blessed event. As all this was happening the sky continued to darken. To the South, Montserrat's volcano started spewing more steam and ash. In time, the wedding party assembled and were joined in wedlock accompanied by bagpipes. A few minutes later totality arrived simultaneously with a large release of ash from the not so distant volcano. One of our group was a 3rd grader who had to write a paper about the eclipse since he was missing school. I had a thermometer among my cameras and other equipment. William took temperature measurements as the eclipse progressed. We started at 96 degrees and saw the temperature drop 72 degrees over the next hour and 30 minutes. I do not know if science done by a third grader can be assumed as fact but the temperature drop was very welcome, noticeable and certainly was much more then the usually reports of 5 to 6 degrees. What a great way to launch a scientific career. 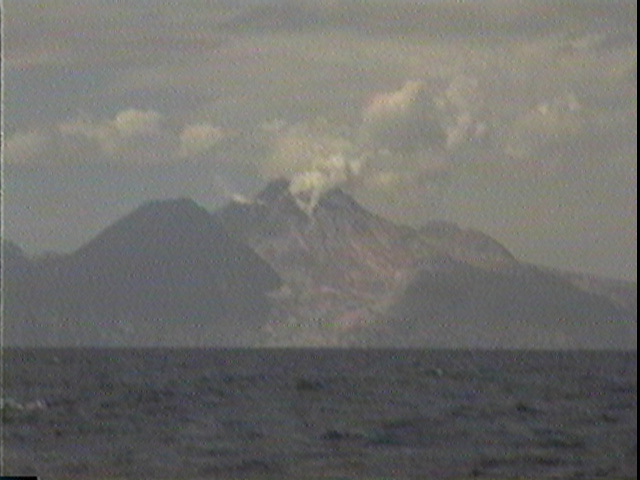 The island of Montserrat is a little over 20 miles Southwest and has a volcano that was actively erupting. From our venue above the cliffs, we were able to see the shadow of the sun sweeping toward us across the sea from the erupting volcano. Our vantage point 300 feet above sea level gave us a great panoramic view of the sea, Montserrat, Guadeloupe and Redonda Islands and several cruse ships between us and Guadeloupe Island. 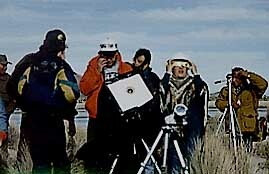 With the TV monitors even the visually handicapped were able to fully enjoy the view of the sun disappearing and the emergence of the corona and prominences. We had a wedding, a bagpiper, a volcanic eruption and a spectacular eclipse all within 3 hours. 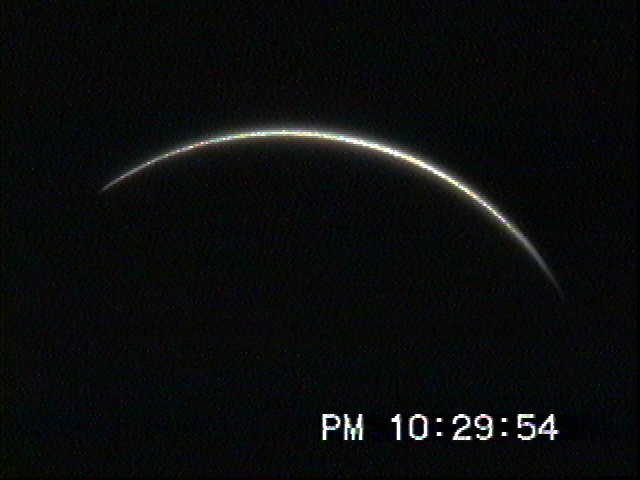 Best of all, there was not a cloud in the sky until just before 4th contact. 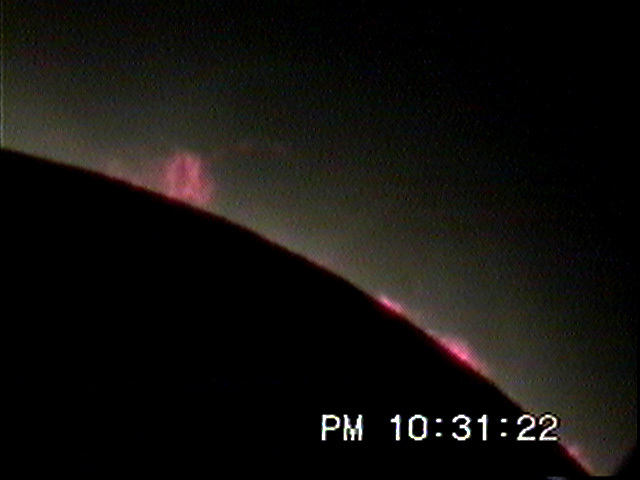 There were two loop prominences, one quite dim. My estimate is the smaller extends out about 19,000 miles the other closer to 40,000 miles. Several Earths would fit in the first and many Earths in the second. This is at about 300 times magnification with a Sony handicam through a 500 mm lens with a 40 mm eyepiece. It was taken at 2:31:53 and :33 local time (18:31:53 - :33 UT). My camera timer was set at Pacific Standard Time (home) and the seconds were 11 seconds slow. My camera telephoto lens was able to capture close up images of the corona and several fiery red loop prominences of the chromosphere. One loop, I estimate, extend more than 19,000 miles from the surface of the sun the other fainter loop was out close to 40,000 miles. 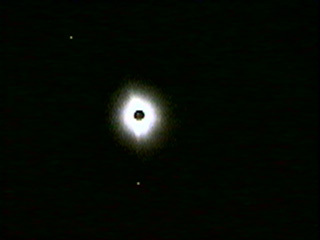 The second video camera captured the corona out about 2 radii of the sun and clearly show Jupiter and Mars. Our 30 friends and the 200 or 300 others that were at our site spontaneously cheered as the sun was occluded and the corona emerged from glare of the diamond ring. Every person was awed by the beauty and the primeval emotional, almost religious, feelings that are experienced as the sun disappears. To the person, it was a wonderful event. This was with the Cannon 8 mm video camera at about 10 time magnification. After the eclipse several folks came and asked for my autograph. Someone had told them I was an astronaut. I explained that to get someone of my body mass off the launch pad would take several extra rocket boosters. No, I am a dentist and amateur astronomer who is enthralled by eclipses and enjoys helping others to have the same experience. I have reviewed the videos and included several of the images we recorded.Ý I do not have the verbal skills to adequately describe the pearly gray shimmer of the delicate streamers of the corona, the purple gray of the sky or the strange sensation one feels as the sun is extinguished. 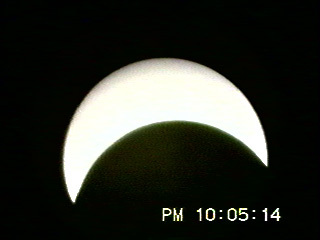 However, looking at a picture of an eclipse vs. being there is like looking at dirt that was used to grow wheat vs. enjoying a warm croissant, fresh from the oven, that was made from the wheat while sitting in a sidewalk cafe on the Seine River in Paris on a warm Spring afternoon with the one you love. There really is no comparison. 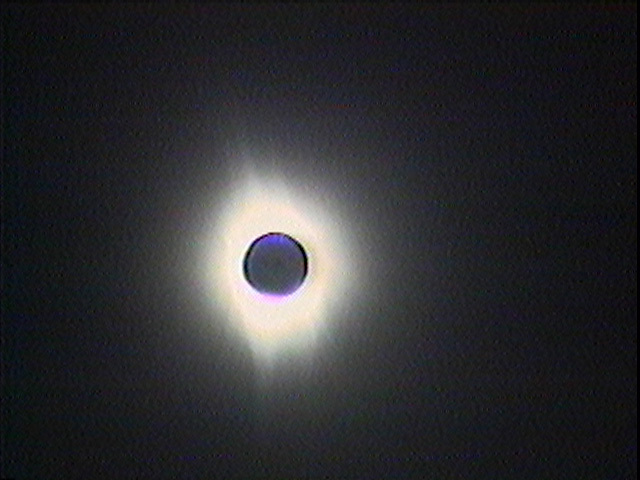 This is again with the Canon and shows more detail of the corona. 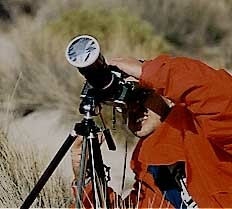 Go to a description of the telephoto lens, video camera and mount I used for the close ups.